Talk about miracles. I've watched one happening before my very eyes over the last week. You are about to meet baby Gwyneth Rose Lawrenson. You may have seen "The Lawrensons" on my 'praying for....' sidebar. If you haven't checked out Nate's blog yet....man, you are missing an incredible blessing. Here is the long story broken down into the bare minimum facts: Gwyneth's mom, Tricia, has Cystic Fibrosis. If you don't know what that disease does, it basically eats away your lungs until they can't function anymore. (It is incurable.) Tricia was all set to begin the process of a double lung transplant, which would, in effect, cure her, when she found out--SURPRISE! She was expecting. 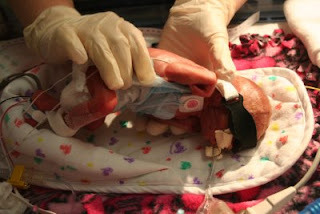 And, no longer eligible for transplant, at least not while she was pregnant. Now, talk about faith--against all medical advice, the Lawrensons continued the pregnancy, knowing full well that they were putting both the baby's and Tricia's life in danger. To quote Nate, they understood full well that God was the maker of life....and only He should be able to take it away. So, keep the baby it was. Tricia fought as long as she could to keep Gwyneth in utero. But one week ago, Gwyneth made her grand entrance into the world! 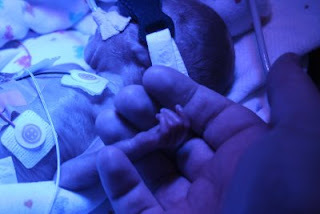 She was born via emergency c-section (for Tricia's health sake) at an astounding 24 weeks, 5 days. No, that was not a typo--24 weeks, 5 days. 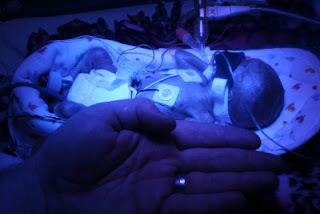 She was one pound, six ounces at birth. 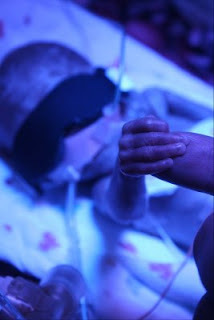 The pics may look a little scary (she is off of the UV lights now--that was a precaution against jaundice) but little Gwyneth is doing incredible well for a 24 weeker. Tricia is fighting hard as well, but has a long road of recovery ahead of her. I know that this family would appreciate your prayers as well--take a minute to visit them and be incredibly encouraged by their faith. Pray with me that God will continue to take care of them, as He already has! I too have them on my "Other Families to Pray For..." list- it is amazing how the Lord is using them, through these circumstances, to reach so many thousands of people!! Thanks also for the post about Mary Grace... I know that Kim and Chris greatly appreciate every prayer being lifted up for them right now! Thanks for posting about these families, Devin! Seeing all they are going through is very humbling. Makes me realize how very small my problems are!